Homemade costumes make me smile! Every year at our party, we get a few people who make their own simple but brilliant costumes. 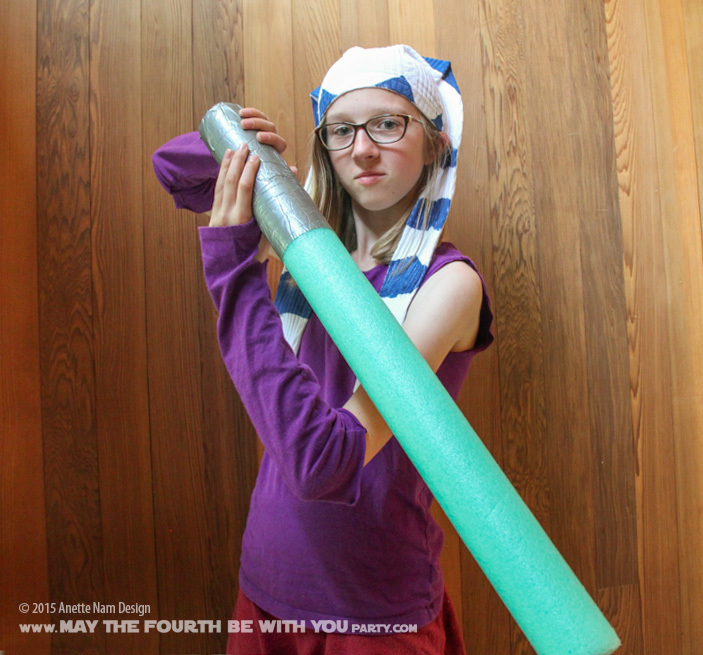 This year, my favorite homemade costume was Ahsoka. I was told it was made in just a couple of hours (the night before, mostly with things found at home), and it is just brilliant in its simplicity. I really regret that I did not get a picture of the back. Ahsoka had a large band-aid on the back of her head, since she was missing her back lek (head-tail). Paint blue triangles and chevrons on stockings (see reference at the bottom of this post). Let dry. Cut sleeves so they are the lengths of forearms. Cut holes on the sides for the thumbs. I believe this was just a piece of fabric gathered with a belt, but you can easily use a store-bought skirt. There are lots of ways of customizing this costume, or to make it more elaborate. Add a belt. “Borrow” hubby’s/dad’s tie for the “flag” on the belt (ASK before you cut it!). Use different kinds of fabric. Add stuffing or batting in the stockings to give the lekku some volume. Have fun with it! I love it! I love that it is more modest too…something you would feel comfortable letting your kids wear!